Nik Mirus is a still-life photographer based in Montreal. His current exhibit at the McGill University Health Centre, Art in Medicine, was developed from a photo essay that appeared in the June 2015 issue of The Walrus. Tools of the trade More than a century ago, the Royal Victoria Hospital inaugurated a training school that helped elevate nursing from practice to profession. Emblematic of the changing role of nurses—from well-trained servants to partners in care—this wicker basket was made suitable for hospital use with a simple cotton lining and a coat of white paint. Well into the 1960s, nurses were expected to follow doctors as they made their rounds, carrying supply baskets like this one, which is kitted out for an ear, nose, and throat specialist. 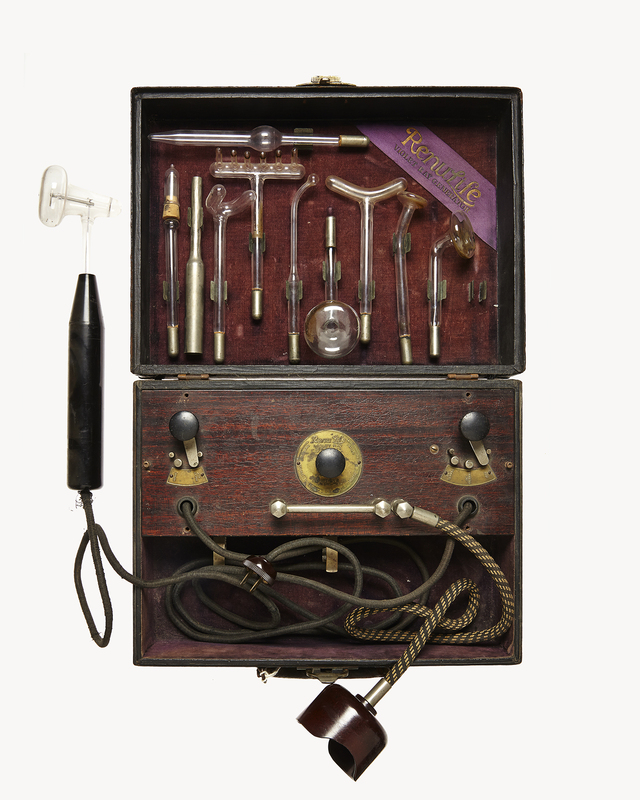 It holds wooden tongue depressors, cotton swabs, a nose dilator, a needle kit, and an alcohol lamp—which was employed to prevent the doctor’s throat-examination mirror from fogging up while in use. 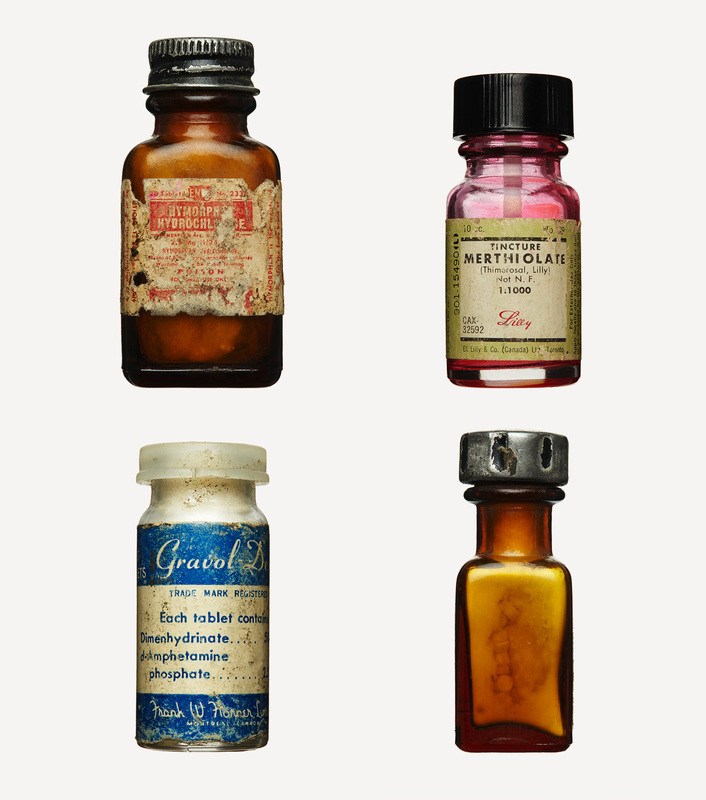 The eerie beauty of obsolete medicine captivates us because it lays bare the barbarousness of the healing arts. The objects featured on these pages, unearthed at the Royal Victoria Hospital in Montreal in the months before its doors closed on April 26, bring the point home. As staff prepared to transfer 250 patients to the city’s shiny new super-hospital, surgeon Jonathan Meakins looked through old rooms and storage cupboards, where the detritus of more than a century of medicine—forgotten drugs, surgical tools, lab equipment—had accumulated. What is modern and current in medicine is only so for a moment. The body and its malfunction are still understood so imperfectly that even bedrock concepts—stomach ulcers and hyperacidity, cardiologists’ concerns over dietary cholesterol—are overthrown regularly. While the periodic table is constant and the general theory of relativity remains as shocking and counterintuitively true as it was in 1915 (when the Royal Vic still was fairly new), medicine is ephemera and fashion, as much about theatre as it is about science. 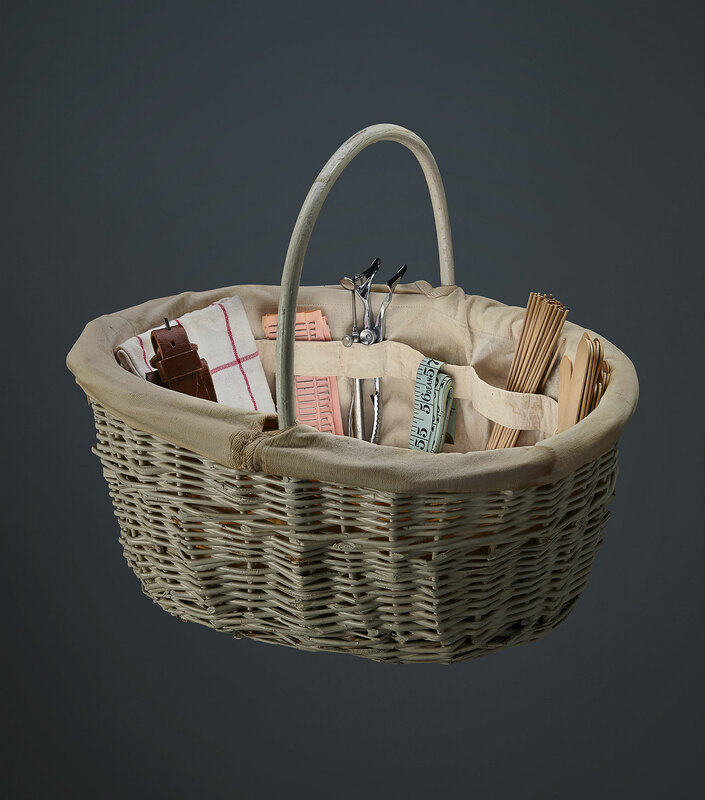 The wicker basket (opposite) that nurses once used to carry medical supplies seems horribly out of place. How could it have been properly cleaned? If a thing isn’t plastic or stainless steel, our sensibility of the moment says, then it is a menace, as surely as C. difficile and MRSA bacteria spread through the Royal Vic in the last years of its life. Imagine being sick in a hospital where the scalpels are not sterile, where operating rooms are disinfected by spraying carbolic acid mist, where the nurses’ evening duty is to sharpen the needles. Try not to twist. It’s an anachronistic response anyway; the patients and caregivers then thought themselves at the cutting edge of surgical and medical science. And they were. They felt as soothed by their innovations as we do by ours. Blown glass has an especially potent and lingering grace. Words engraved in beautiful looping copperplate script on the Müller X-ray tube announce its age, and the art of its creation remains apparent in a way that has long outlived its usefulness. The medical sensibility that valued the beauty of such apparatuses was retired long ago. In another eighty years, our current medical cathedrals and elaborate treatment regimens will appear just as quaint—and creepy—as those of nearly a century ago. Nobody then will be made to lose all their hair and most of their bone marrow in order to have their cancer cells switched off. Our grandchildren will speak with horror about the use of radioactivity to treat malignancies—just as we do when discussing the use, in the flapper era, of arsenic and mercury to treat syphilis. And they’ll wonder at the untreated problems around us: a quarter of us obese, 10 percent of us diabetic, addiction and depression prevalent and yet little understood. Norman Bethune’s elaborately beautiful pneumothorax apparatus was used to collapse a tubercular lung so that it could heal. In that pre-antibiotic era, the insertion of the needle into the chest was more talismanic than curative. We may be confident that much of what doctors prescribe to patients today will be disdained as barbaric ritual tomorrow. Bottled up The faded labels of these bottles list several drugs still used today. Hymorphan is a potent opioid derived from morphine; Gravol tablets were produced by the Montreal company Frank W. Horner Ltd. in the late 1970s; and Merthiolate, a topical antiseptic that contained the controversial mercury-based preservative called Thimerosal once used in vaccines. Archivists at the Royal Vic don’t know what the unmarked bottle held. Acid washed Designed by British surgeon Joseph Lister in 1867, this carbolic-acid diffuser helped revolutionize surgery, ushering in the strategy of antisepsis, whereby the patient, the operating theatre, the doctor’s hands, and the instruments could be disinfected to control the spread of disease. 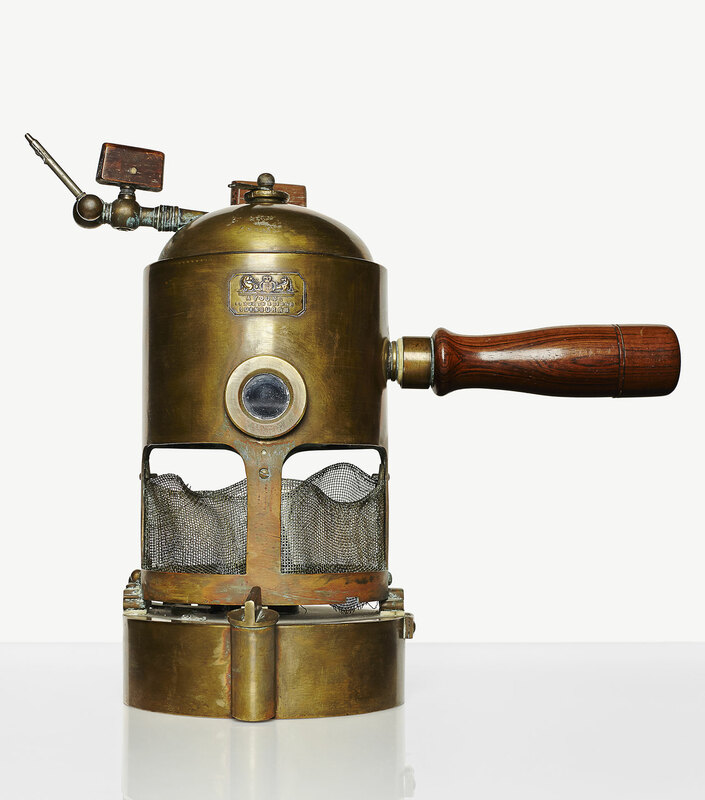 This diffuser, which was brought to McGill University in 1888 by Sir Thomas Roddick, worked like a kettle: a burner created steam, in the chamber above, that escaped through the nozzle. It dramatically reduced post-operative infections and deaths due to amputation, but was a crude and unpopular way of managing infections. It also led to the introduction of surgical gloves—first worn by doctors and nurses as a way of avoiding dermatitis caused by the spray. Inside job Delicate as a Christmas ornament, this blown-glass X-ray tube was found in the attic of the old nurses’ residence at the Royal Vic, wrapped in 1920s newspaper alongside a pair of lead-lined gloves. Glass-blower Carl Müller began manufacturing such tubes only months after German physicist Wilhelm Röntgen discovered X-rays in 1895. 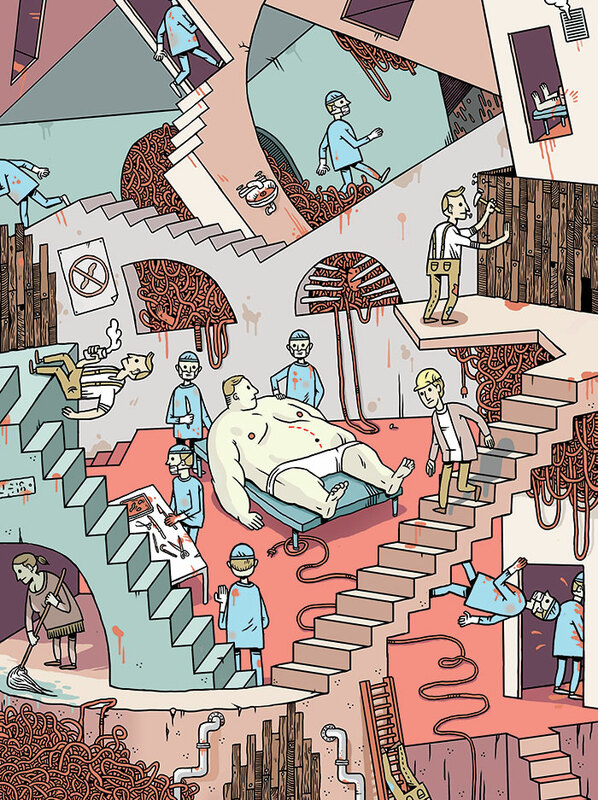 Doctors now could accurately examine the insides of a patient without resorting to surgery. Even shoe stores used X-rays to ensure a proper fit. The cavalier use of radiation had terrible consequences: Müller himself died of exposure in 1912, at the age of sixty-seven, and the use of lead gloves became common only after it was noticed that X-ray technicians were losing fingers. 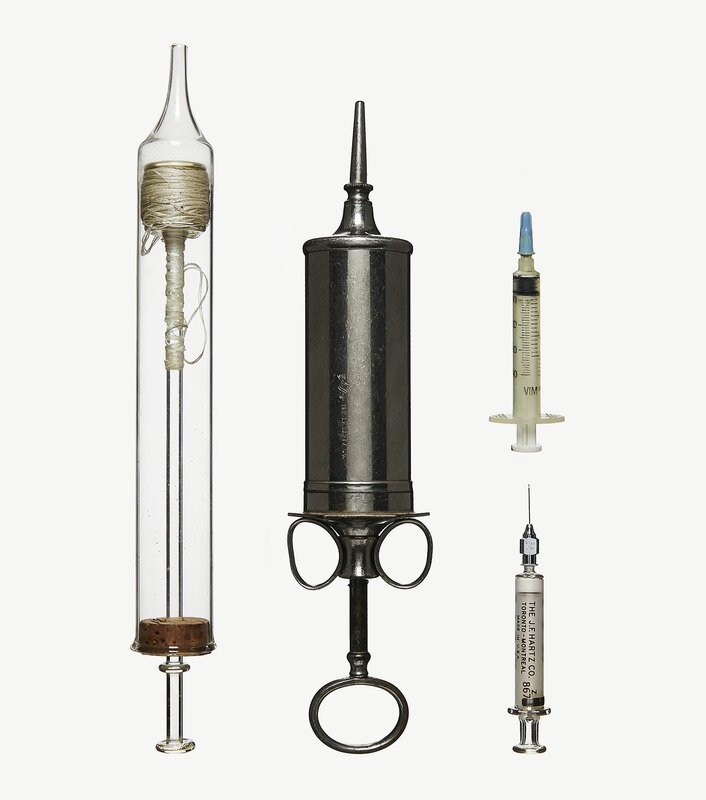 Stick shift (left to right) Glass irrigation syringe with cork stopper and coiled-thread seal, in use until the early twentieth century; large enema syringe from the late nineteenth century; and twentieth-century models with removable needles. The glass and metal one (bottom right) could be disassembled and disinfected for reuse. This killed some pathogens, but it made others more resilient. An increasingly sophisticated understanding of cross-contamination led to the disposable plastic syringe with removable needle (top right), and to the first fully disposable plastic syringe, invented in the 1950s but not used widely until the ’80s. 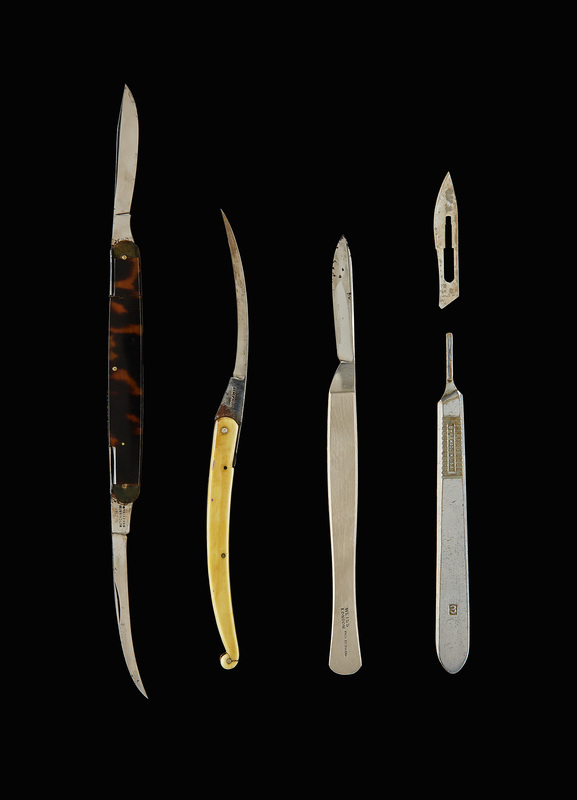 Cutting edge Found in an East India Company medical kit, the first two scalpels (left to right) are typical of nineteenth century surgical knives: a double-bladed pocket scalpel with tortoise-shell (c. 1850), and an ivory-handled curved blade (c. 1818) used for cutting up—to sever a tendon, for example—rather than cutting down. The single-blade metal scalpel could be sharpened for reuse and boiled to disinfect. In 1915, Americans Charles Bard and Morgan Parker produced the first two-piece scalpel with a disposable blade. Pharm Team Before mass manufacturing of medical equipment, many nineteenth-century and some early twentieth-century tools were fabricated in hospital workshops. 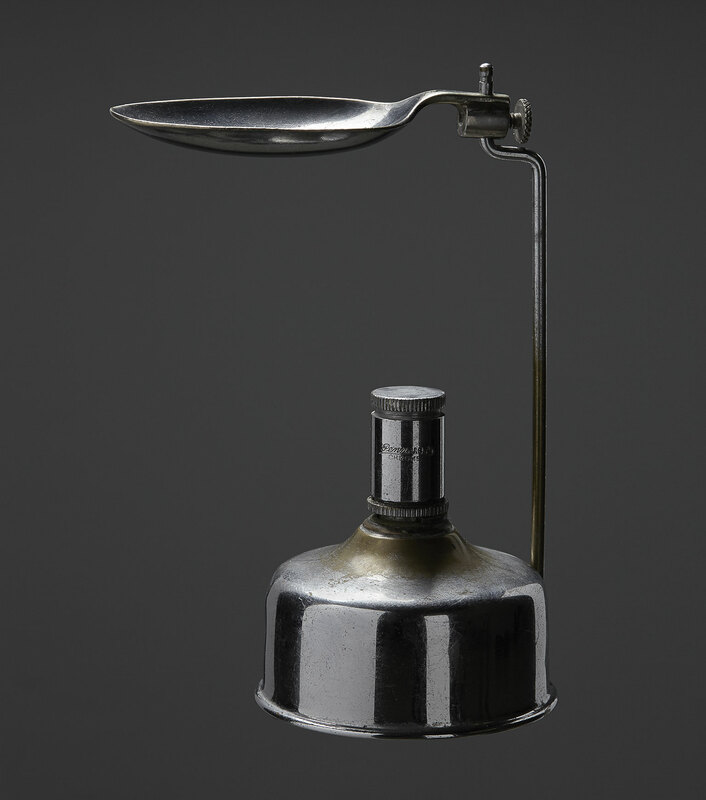 This spoon was attached to an alcohol lamp so that medications could be prepared to order. A nurse or physician would melt granules of morphine before injecting patients. Such drugs are now prepared in a hospital pharmacy or off-site at a pharmaceutical laboratory. Increasingly, robots are being used to prepare and dispense drugs, as a way of reducing dispensing errors, which persist as a common medical problem. Dangerous lesions Before antibiotics, treatments for diseases such as pulmonary tuberculosis could be severe. This artificial pneumothorax apparatus is a case in point. 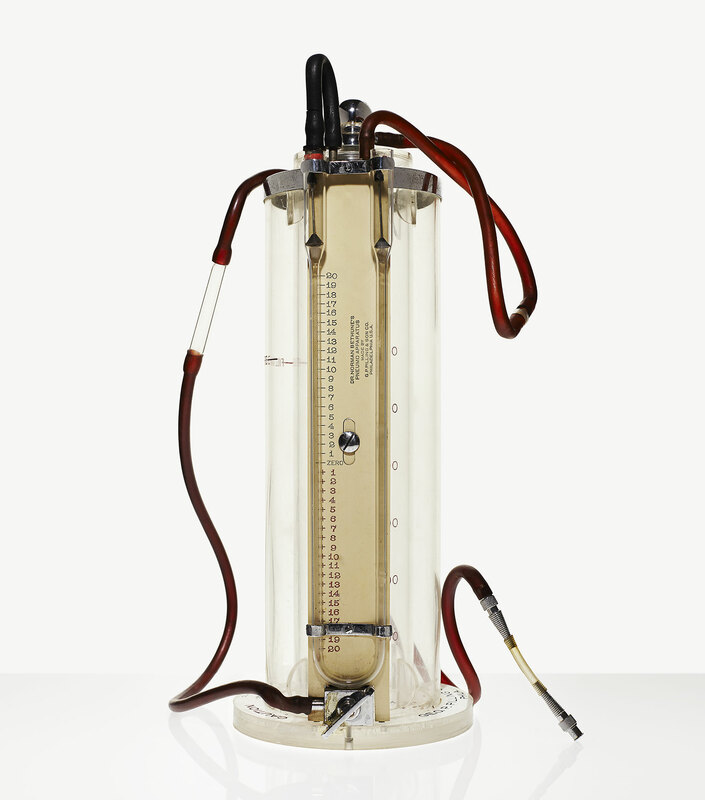 Invented by Italian physician and professor Carlo Forlanini in 1888, it pumped nitrogen into a patient’s chest cavity, causing a lobe or lung to collapse and heal like a lanced boil. Designed by Norman Bethune around 1930 and manufactured by the Philadelphia firm George Pilling & Son, this model was portable. Bethune contracted TB in 1926 and treated himself successfully, but colleagues remained skeptical. After being dismissed from the Royal Vic, he opened a free medical clinic in Montreal in 1935. He died in China while working as a battlefield physician for the Red Army in 1939. 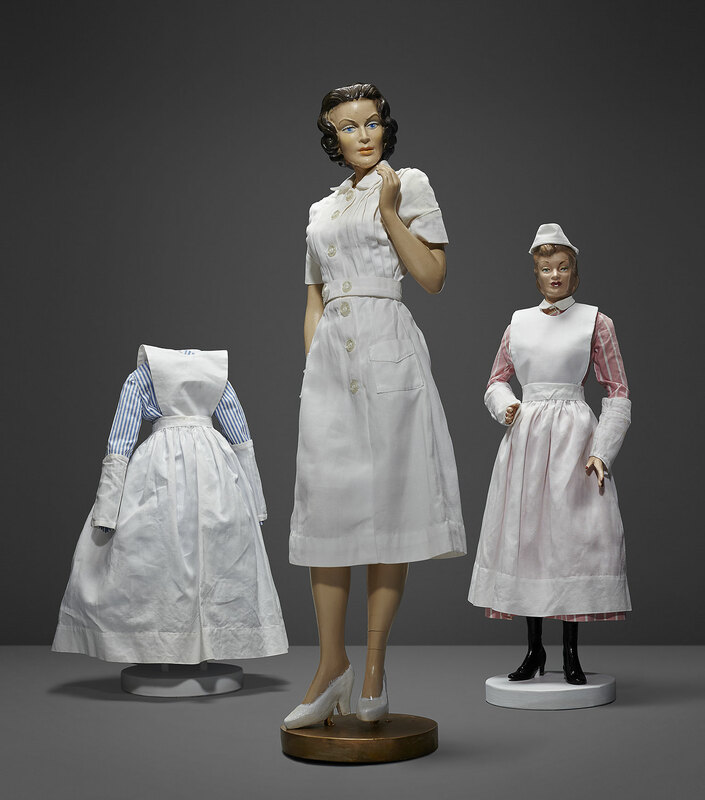 Dress code Salesman samples show the evolution of nurses’ uniforms through the early twentieth century. Shorter hemlines—from ankle length before World War I to knee length after World War II—reflect not only a change in fashion but also a growing understanding of how infections spread. Long sleeves and skirts that touched the ground might have appeased Victorian notions of propriety, but they also carried bacteria from ward to ward and patient to patient. Before the hospital was air conditioned, the voluminous skirts of the earlier uniforms also were oppressively hot to wear in the summer. To stay cool, some nurses would trim the hems of their skirts, relying on their large aprons to shield their legs from view. 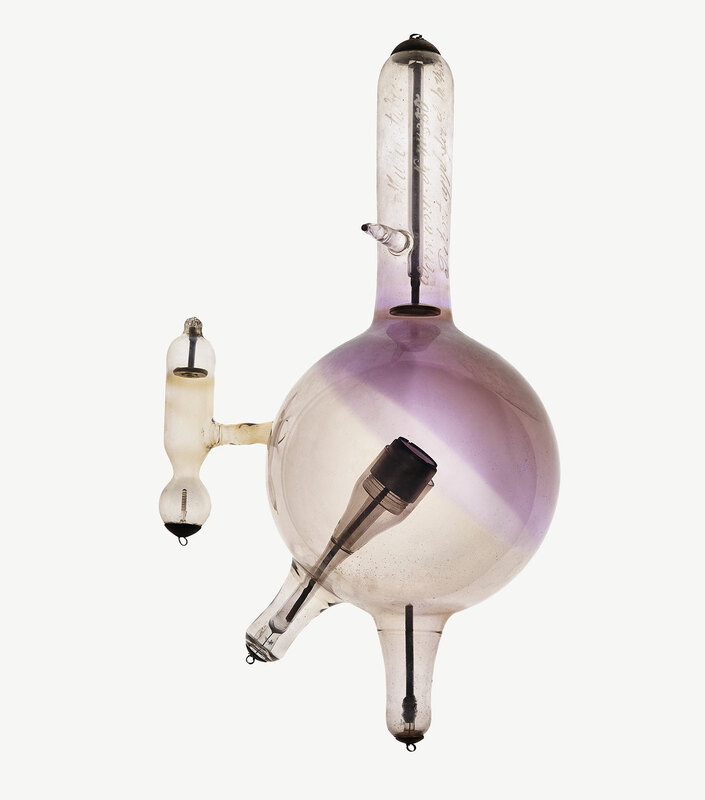 This Renulife Violet Ray Generator was used in the early twentieth century as a harmless treatment for a host of ailments including rheumatism, insomnia, headaches, indigestion, constipation, and even deafness. The glass probes would glow purple from the contained argon gas and could be applied across the body. The comb attachment was claimed to treat dandruff and scalp ailments. 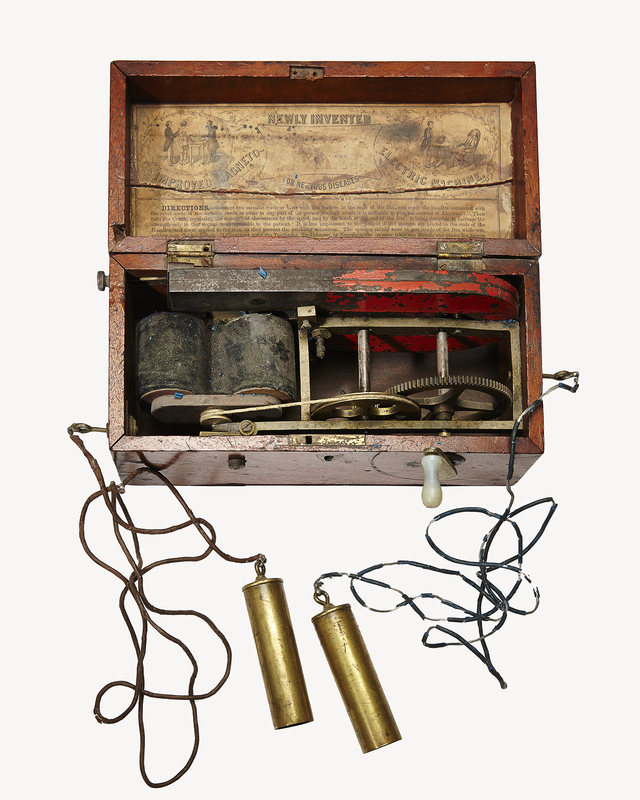 An Improved Magneto-Electric Machine from the late nineteenth century that claims to treat “nervous diseases,” including toothaches and nerve pain. The patient would hold one of the metal rods, while a physician turned the crank to regulate the strength of the electrical current and applied the second rod to the affected area. 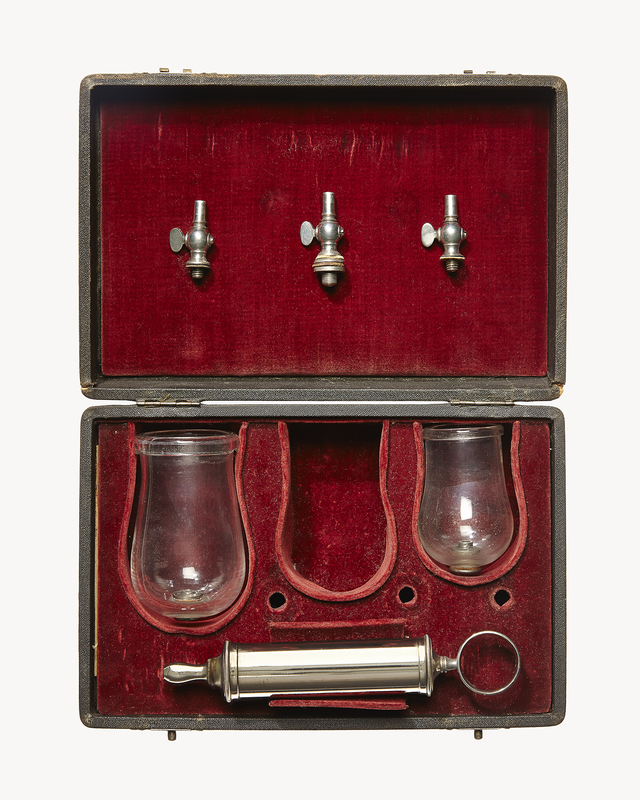 Nineteenth-century example of a cupping therapy set, used to treat muscle pain. The included syringe and valves would be used to create suction and adjust pressure within the glass bells when applied to soft tissue. Dry cupping would cause the skin to tumefy, or become swollen, while wet cupping would include drawing blood through incisions in the skin into the bells. 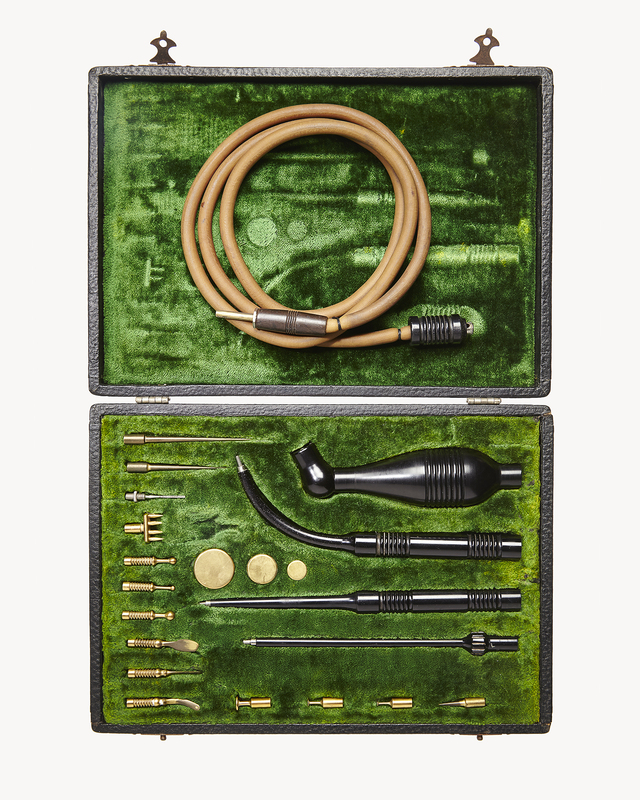 A set of accessories for an electro-coagulator, used as both a method of electrotherapy and to cauterize wounds without making an incision or to prevent hemorrhaging during surgery.